When I started on the project I have been working on for the last few months, it lacked any kind of automation or pipeline tools for the Art department. There was no kind of convention in the names, and no kind of structure to the project. It was a nightmare! Did I mention the pipeline had artists working on two different platforms? Compensating within the tools for the different folder structures on Mac and PC computers also became a concern, although it did not end up being as much of a problem as I thought it would be. From day one it was a goal of mine to introduce naming conventions, and restructure the project to be more pipeline friendly. It was a crazy-big job, but now its starting to pay off with some art tools. 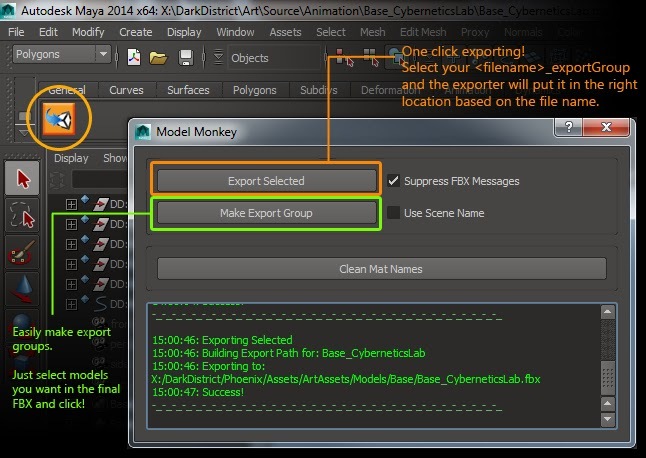 To address the lack of exporting tools I wrote a Maya exporter that takes advantage of the new naming conventions, predictable folder structure and Python's awesome ability to manipulate strings. Behind the scenes it has a dictionary that matches the scene file's prefix with the Unity project directory the exported FBX is meant to go in, as well as loading in a pre-configured fbx settings file to reduce the chance of messed up exports. Functionally its still fairly basic, but it has been written to be expandable as required, and portable across projects, just by editing the separate configuration file. It also has the added bonus of working across both Mac platforms and PCs. Maya 2014 includes Pyside, which allows access to the powerful QTFramework. With just a few lines of code, any artist has access to the same tools that would have previously required a separate PyQt4 installation.